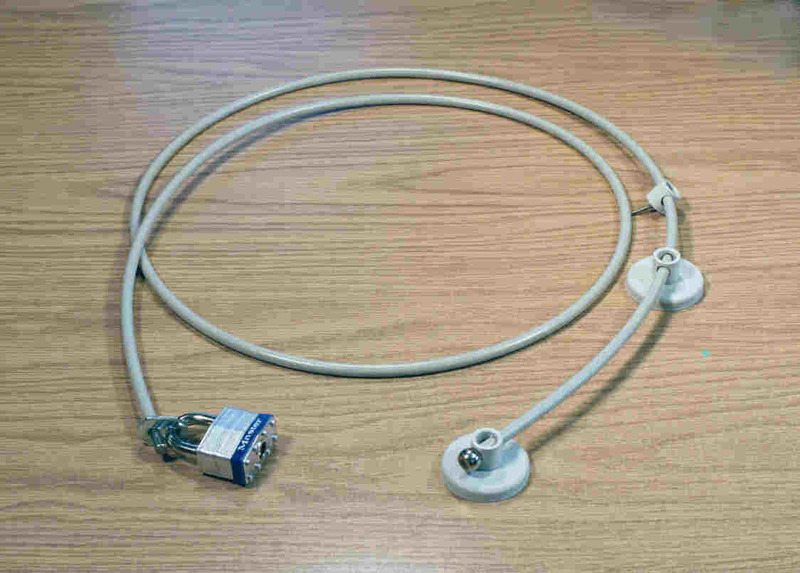 Cable Locking Systems for computers and business machines for a variety of security levels. From 3/16" to 1/2" diameter wire rope. 1/4" diameter wire rope, black or beige-vinyl coated (5/16"-overall diameter ) x 7 1/2 feet or 10 feet in stock. Custom made in any length. 7x19 strands galvanized aircraft cable. Padlock - Master Lock brand padlock (model no. Master #1). Hardened 5/16"-diameter shackle. Double-notch locking shackle. Laminated construction. 4-pin tumbler cylinder. Thousands of key numbers are available. Supplied with (2) Glue Disk machine attachments (for computer, monitor or peripheral). Natural Gum rubber bonded to steel disk for additional pull (tensile), shear and peel strength. 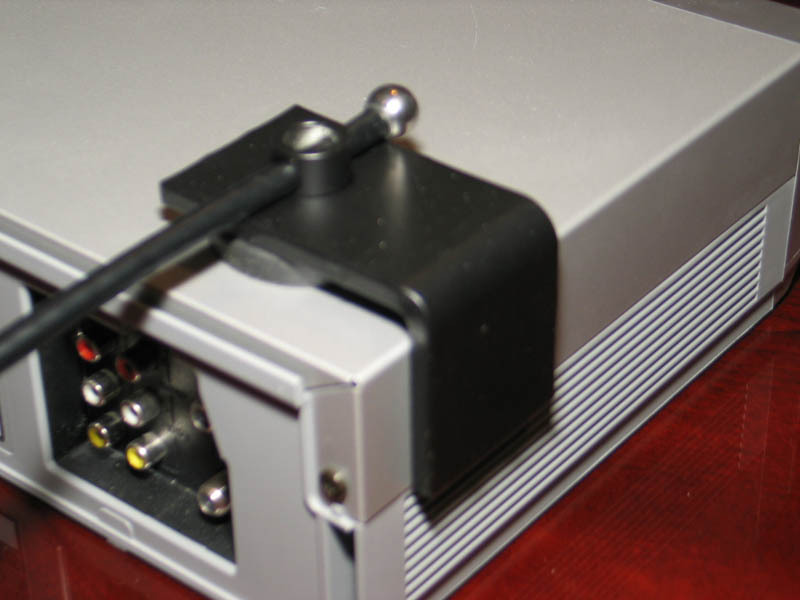 Optional Steel Bracket (1/4"-thick x 2"-wide) protects computer's internal components. 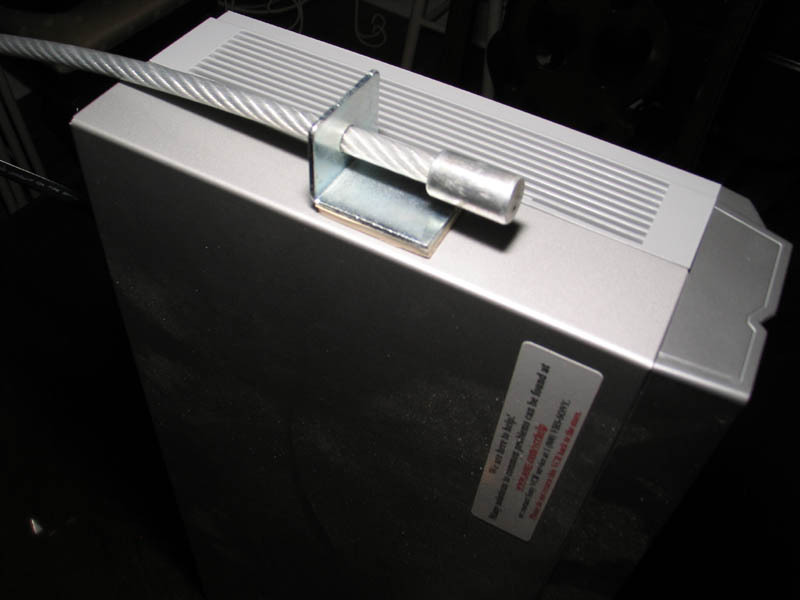 Locked FlexLok prevents bracket removal. 1/2"-diameter wire rope, beige-vinyl coated (5/8"-overall diameter ) x 6 feet in stock. 7x19 strands galvanized aircraft cable. Maximum protection. Padlock - Master Lock brand padlock (model #220). Hardened, boron alloy shackle, 7/16"-diameter. Double-ball locking shackle. Solid zinc die-cast lock body, chrome plated. 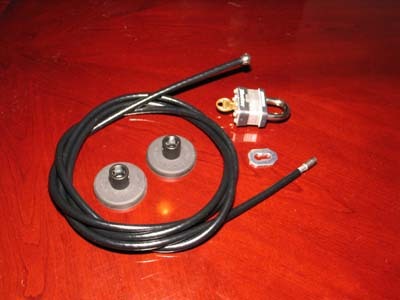 Removable cylinder can be replaced or keyed to a new number. 5-pin tumbler cylinder. Metal plate keyway protection. Thousands of key numbers are available. Tube Fastener (attached to Glue Disk machine attachment) and Keyhole Fastener are case hardened. Supplied with (2) Glue Disk machine attachments (for computer, monitor or peripheral). Natural Gum rubber bonded to steel disk for additional tensile, shear and peel strength. Pull (tensile) strength - over 7,000 pounds per sq. in. (per Glue Disk). 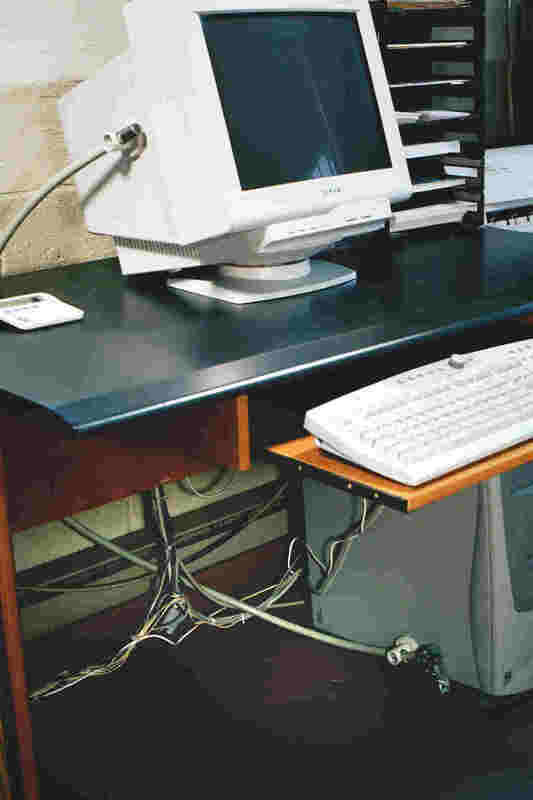 Supplied under requirements contract to the City of New York to all city agencies, including, among others, Human Resources Administration, Administration for Children's Services, Homeless Services, Dept. of Probation. 1/4"-diameter wire rope, clear-vinyl coated (5/16"-overall diameter) x 7.5 feet in stock. 7x19 strands of galvanized aircraft cable. Padlock - US Padlock brand padlock (model no.27003-KAY). Hardened 9/32"-diameter shackle, double-notched, laminated construction. 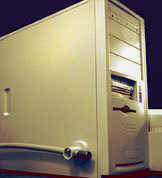 Supplied with (2) Metal Plate machine attachments (for computer, monitor or peripheral). Natural Gum rubber bonded to plate base for additional tensile, shear and peel strength. Pull (tensile) strength - 5,000 pounds per sq. in. (per Metal Plate). Internal computer security board protection. 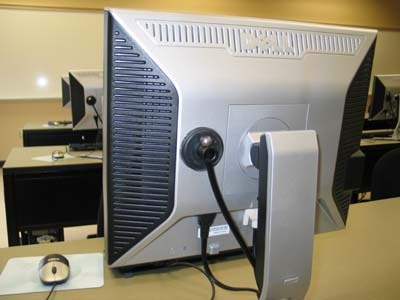 Tube Fastener attached to computer with the computer's case-to-frame screw prevents the unscrewing of the case with FlexLok cable through the tube. Mouse/keyboard theft protection with mouse washer. 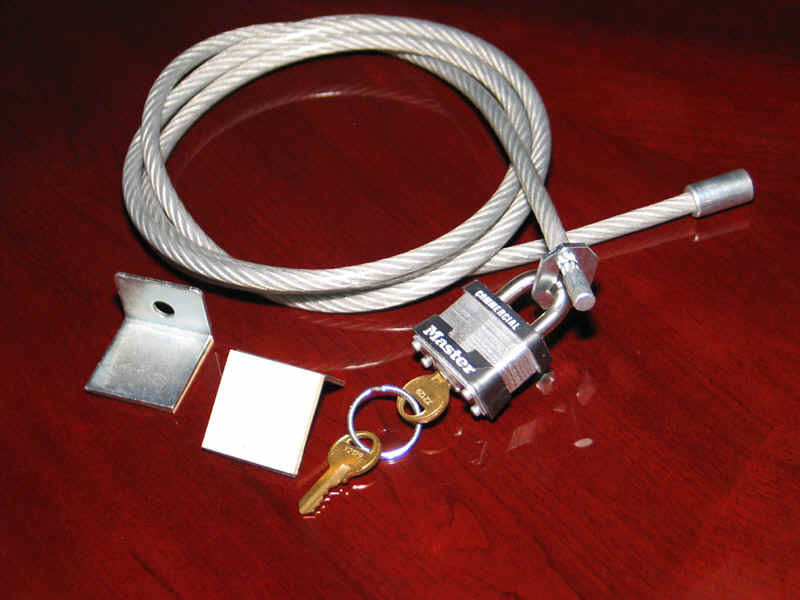 Customer owned padlocks can be used for keying flexibility. Easy installation. 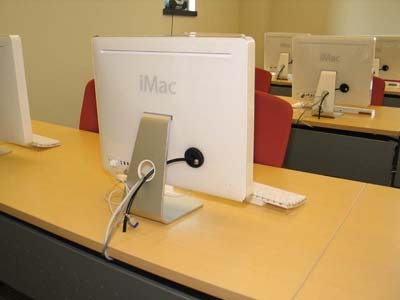 No drilling required with existing workstation hole. 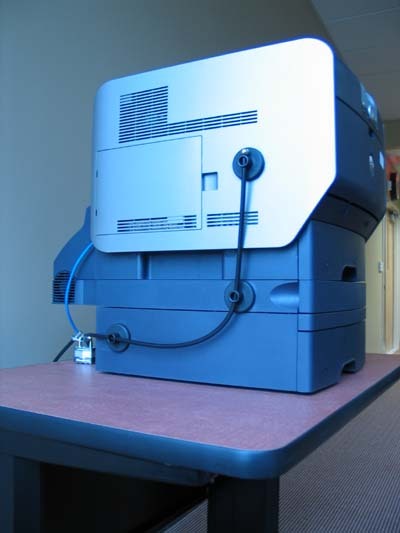 One system fits all equipment - any type or size. Meeting three varying levels of PC security.